NEW YORK – May 13, 2014 – CBS Consumer Products unveiled today the first licensing partners for the new Showtime® series, Penny Dreadful -- a frightening psychological thriller set in Victorian London. Setting the foundation for a concentrated merchandising campaign, Titan and Bif Bang Pow! have signed on to bring the horror series to fans through special edition books, tarot cards and character figurines. Most products are available now at the SHOWTIME’s online store. Titan Books, a leading publisher of high-quality film and TV tie-ins, will publish special editions of the classic novels that inspired the Penny Dreadful series. Deluxe hardcover editions of Mary Shelley’s Frankenstein, Bram Stoker’s Dracula and Oscar Wilde’s A Picture of Dorian Gray will each contain original black and white illustrations by Martin Stiff, Louie de Martinis and Ian Bass. These deluxe editions will be exclusively available through the Showtime store this month and then through bookstores and online retailers in September. Titan Books will also be publishing The Art and Making of Penny Dreadful, which goes behind the scenes to unearth the show's secrets and dissect every aspect of the production, with exclusive interview material with the creator, cast, and crew, and a wealth of previously unseen images. The Art and Making of Penny Dreadful will be available for purchase in April 2015 at the SHOWTIME online store. Available now, Bif Bang Pow! introduces a deck of tarot cards inspired by the ones used throughout the series. 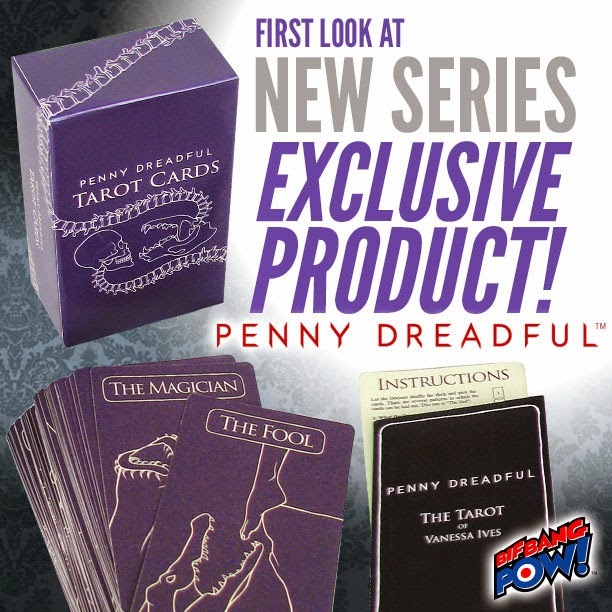 A deluxe deck of the tarot cards will be sold at San Diego Comic Con, along with characteraction figures including Ethan Chandler, played by Josh Hartnett in the series,and Vanessa Ives, played by Eva Green. Additional character action figures will be available in late summer. Apparel, jewelry, drinkware, phone cases and episodic-themed merchandise will roll out throughout the season and beyond. About Bif Bang Pow! Bif Bang Pow!™ (bifbangpow.com) produces first-rate collectibles for such popular properties as Star Trek™, Dexter®, The Big Bang Theory™, Saturday Night Live™, The Awesomes, Mike Tyson Mysteries, Adventure Time™, Regular Show™, Penny Dreadful ™, The Venture Bros.™, The Six Million Dollar Man™, Battlestar Galactica™, NCIS™, and The Twilight Zone™. Founder Jason Lenzi is a seasoned television producer and the ultimate fan of cultish pop culture. So when he created his company in 2005, he took the fan's perspective. His idea was to bring items to the marketplace that he himself would want to own. Cultivated from TV, movies, books, comics, music, and more, Bif Bang Pow!’s mission is to provide high-quality action figures, toys, and collectibles to the massive cult audience (and kids of all ages) that wishes these toys were already in their collection. About Titan Publishing GroupTitan Books has been twice listed as the fastest growing independent publisher in the UK by the Bookseller magazine - in 2009 and 2011, and was nominated as Independent Publisher of the Year in the 2012 Bookseller Awards. A leading publisher of preeminent science-fiction, fantasy and crime fiction as well as high quality film, TV and Gaming tie-ins, Titan Books has partnered with globally recognised entertainment franchises to produce stunning titles tied to DOCTOR WHO, ALIEN, classic ROBOCOP, GODZILLA, PLANET OF THE APES, BATMAN 66, TITANFALL, ASSASSIN'S CREED and 300. Titan Publishing Group is an independently owned publishing company, established in 1981. The company is based at offices in London, but operates worldwide, with sales and distribution in the US and Canada being handled by Random House.